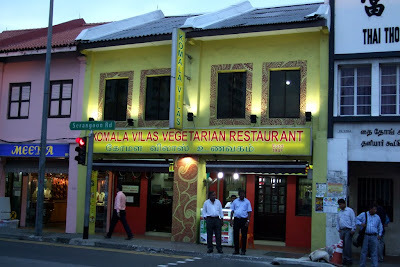 I've been patronising this little South Indian Vegetarian Restaurant in Little India since my NS days in 1994, although I do not go there on a regular basis, I do like to bring overseas visitors there and whenever I find any reason to go there. This restaurant has been around since 1947 and has been popular with the local indian and non-indian populations alike! I've always ordered the same thing when I dine there: The South Indian Vegetarian Meal, Paper Thosai and the Marsala Thosai, so much so that I don't even know what the other dishes are called after all these years! If I find a good thing, I'll stick with it! So just yesterday, I found another reason to bring a friend there since it was his first time eating in Little India! Faithfully, I ordered the South Indian Veg Meal for him and a Marsala Thosai for myself, complete with 2 Lassis (Yoghurt drinks). 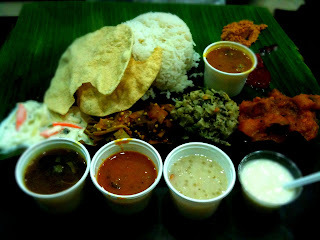 South Indian Vegetarian Meal - It's $6.70 and all-you-can-eat free refill for rice and all the accompanying dishes. I rarely go beyond the first serving as you can see, they do tend to give a lot of rice! I've no idea what goes inside those little side dishes but they are all wonderfully cooked with lots of Indian spices. They are not very hot but with lots of flavor! There's even a small cup of soup and a ginger sago dessert that goes with it. 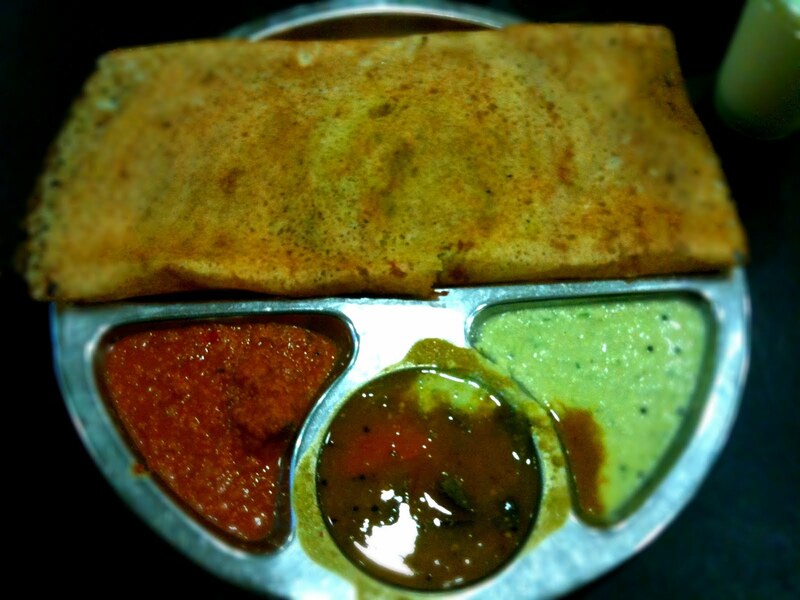 Marsala Thosai - $2.70. A tad more filling than the paper thosai, the Marsala Thosai is filled with potatoes cooked with spices to the right consistency. I like to eat it with the curry best (middle), not so much with the coconut based dip on the right hand side. For the price, it's definitely 2 thumbs up! And of course, they say: "when in Rome, do as the Romans do", so I always wash my hands clean and tuck in to my food with my fingers when I am there! Lookout for the bright yellow sign that says "KOMALA VILAS VEGETARIAN RESTAURANT" along the main road of Little India!